Just because Halloween is on a Monday doesn't mean you can't go all out. I will probably end up taking care of a few nieces and nephews that day, so the house needs to be festive! 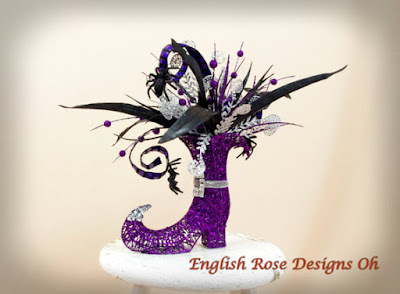 If you are looking for more fun and whimsical decor then English Rose Designs will have it. When I see this store, I think of a wacky, eccentric witch. All of these items are family friendly and will definitely amaze your guests. Come check out these colorful options! 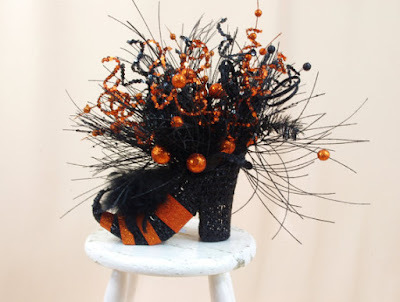 You can use this wicked witch Halloween shoe as the centerpiece on your table. I don't know about you, but I instantly thought of the Wizard of Oz when I saw this piece. It's entertaining and perfect for the holiday. It's important to get everyone in the mood right from the get go! 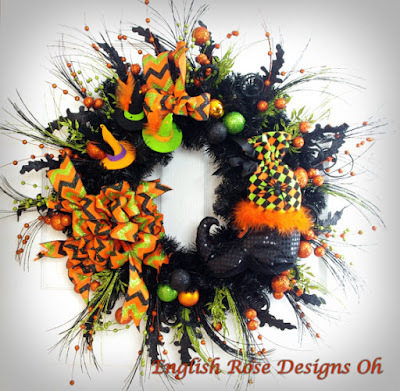 This Halloween wreath will be the first thing your guests see. I love how all the hues weave together, especially the toxic green color! 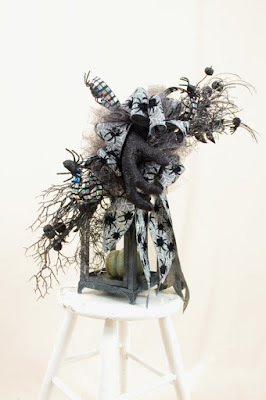 If you would prefer creepier witch decor, than this Spider centerpiece is bound to turn heads. People will be asking themselves "Are those real spiders all over that mason jar?!" That would send chills down my spine. Going along the theme of an evil spider witch, this web witch Halloween shoe could also be used. I don't know about you, but this reminds me too much of Spiderman. That's unfortunate, because I love combining green and purple together for Halloween! Who says witches can't be lovely and sophisticated? Use this skeleton witch hat for a black and silver Halloween party. I think the leaves give this hat some mischievous character! Do you decorate a Halloween tree? This is a great opportunity to start, especially if you have little ones to entertain! 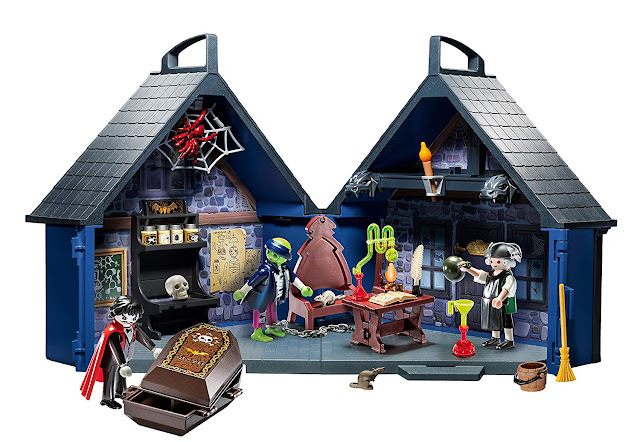 Put on some classic Halloween jams, take the Christmas tree out early, and start putting up Halloween decor. 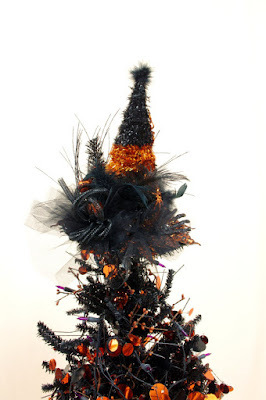 This witch hat tree topper is great inspiration. 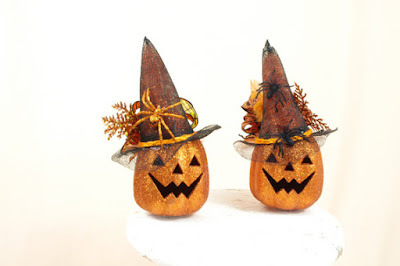 These jack o' lantern centerpieces could be placed throughout your home. It's such a classic way to create a merry atmosphere. 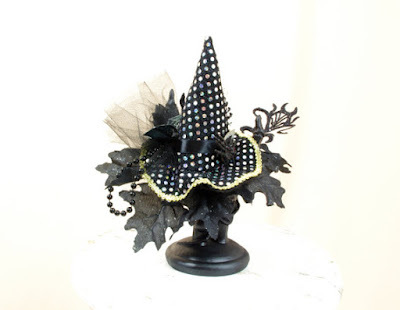 Plus, the hat on the top and how glitzy they are will make the place extra magical! 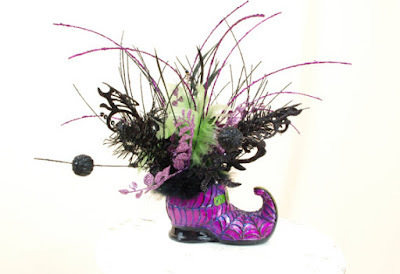 The wire work for this purple wicked witch shoe is incredible. 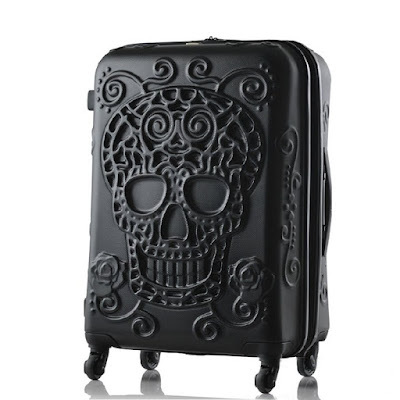 I think this would be a great decor item for a Tim Burton party! The twisty purple and black striped silk sticking out from the boot is my favorite feature. 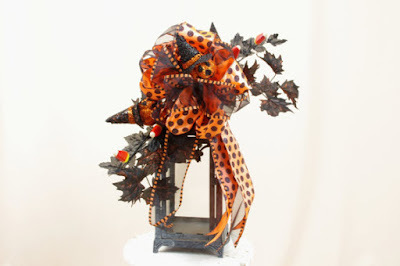 You could store so much candy in this Halloween lantern centerpiece. For decorative purposes, I would fill it up with candycorn! Of course, you could just use this as a normal lantern. With all the ribbons and bows, it'll cast all kinds of cool shadows. 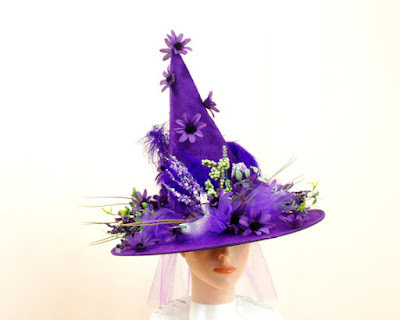 I wouldn't be terrified of a witch wearing this purple flower witch hat. It's quite elegant and beautiful. You could use it for decor or wear it yourself! Be careful though, it is a very tall hat. 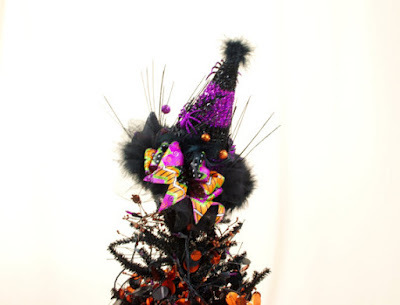 The tree that this witch hat topper is so cool! Maybe you could try to recreate it using the topper. If you look carefully, you can see a sinister hand on the brim of the hat! I'm really excited about English Rose Designs. Not only is their stuff vibrant and fun, but all of these decorations are show stoppers. They're totally unique and would set the Halloween mood! Who doesn't like witches anyway? Make sure to comment below and let me know what you would do if you had these to decorate your home!